LUVERNE rear steps provide a functional, full-width stepping surface on the rear of a cargo van. 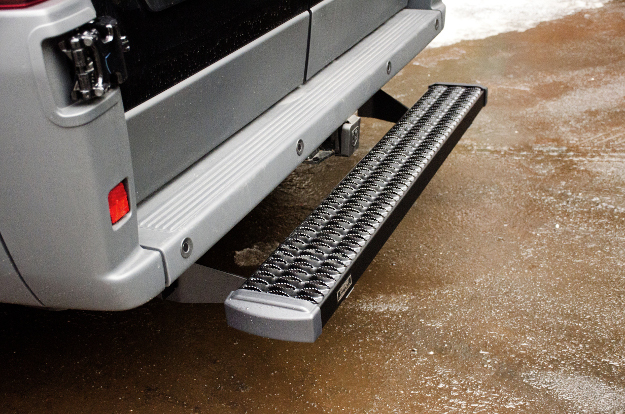 Designed to mount on commercial vans and work vans, a rear step offers convenient access to the back cargo area. This is especially useful for delivery vans that are used for hauling large amounts of cargo and jobs that require frequent entry and exit from the rear of the vehicle. 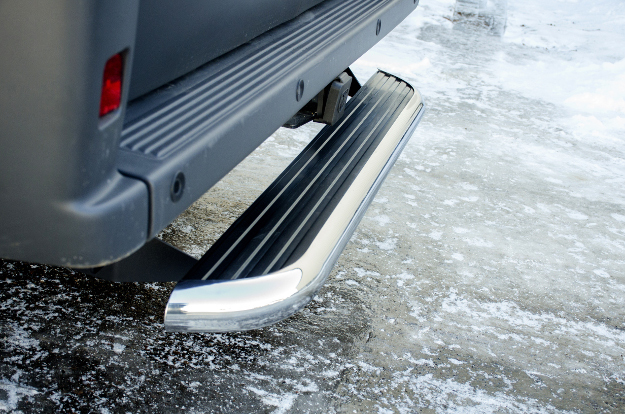 LUVERNE cargo van rear steps are available in multiple styles to match our popular running boards and side steps. Each one provides a 54" stepping surface and mounts with vehicle-specific brackets for a custom fit. Like the rest of our Grip Step™ line, the Grip Step™ rear step features a unique, expanded metal tread for superior traction in any type of weather. It also has a 7" width for reliable, comfortable footing, and it is built from aluminum alloy, making it strong, lightweight and rust-free. 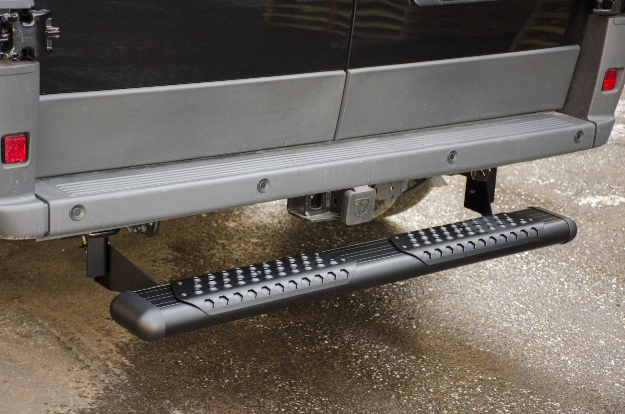 To finish things off the Grip Step™ rear step and add a professional touch to your work van, we also apply a durable textured black powder coat and contoured black plastic end caps to further protect against dirt, moisture and other threats on the job. The MegaStep® cargo van rear step combines the style of a nerf bar with the comfort and functionality of a running board. It has a 5" wide, non-skid rubber tread that extends the full width of the step to offer safe, secure entry into the vehicle. It also features a dual-construction, comprised of a strong, lightweight aluminum core and a high-polish stainless steel trim for a bright, clean accent on your vehicle. O-Mega II™ 6" oval rear steps offer the ultimate in durability and aggressive style for work vans. They are built from lightweight, non-corrosive aluminum -- including both the boards and the step pads -- and they are covered in a durable powder coat finish with black end caps. O-Mega II™ cargo van steps also feature non-skid aluminum step pads with high-traction, protruded metal treads. The pads mount with self-tapping screws for custom positioning. They can be mounted to factory specifications or adjusted to suit personal preference.